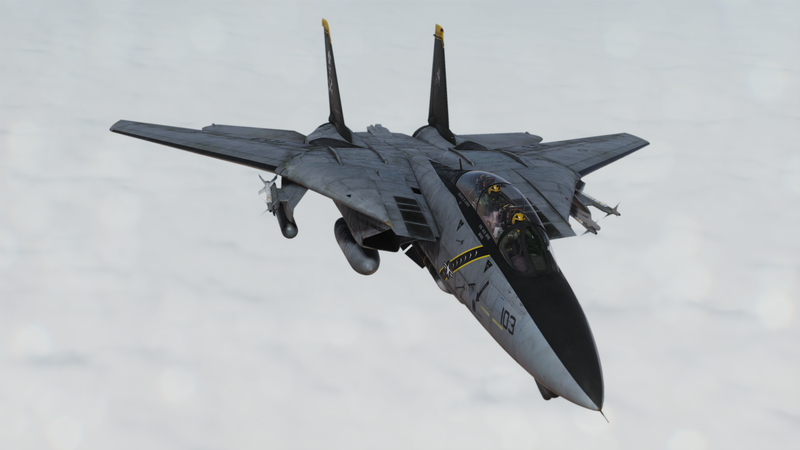 Thread: Heatblur F-14 Tomcat Released!!! Bought it a little while ago and took her for my first spin. Made it off the ground and back on again without any mishaps all thanks to my hands on experience years ago with another great ground breaking F-14 model and it's very similar high attention to detail on the flight dynamics. I figured if this virtual jet was going to bite me in the backside, it would be when pushing it real hard in a flight demonstration sequence type of flight of rolls, high-g turns, high AoA, steep vertical climbs in burner and then coasting back down while being careful on the stick to not mishandle her during slow speeds and high AoA. The buffeting is your WARNING to back off and when you have the wings full swept back and you push it too hard in a pull, you WILL be sorry! I made two practice approaches with touch and goes then a full stop. I found it to be quite stable in tracking the runway centerline and I did left and right drift deviations to simulate following the moving carrier deck. So long as you don't do a lot of ham-handing on the stick to swing the wings back and forth, your approach and landings/traps should easily be stable. VERY light stick inputs are all that's needed to make corrections during your approach! I am very impressed! Best $80 I have spent on anything in some time. 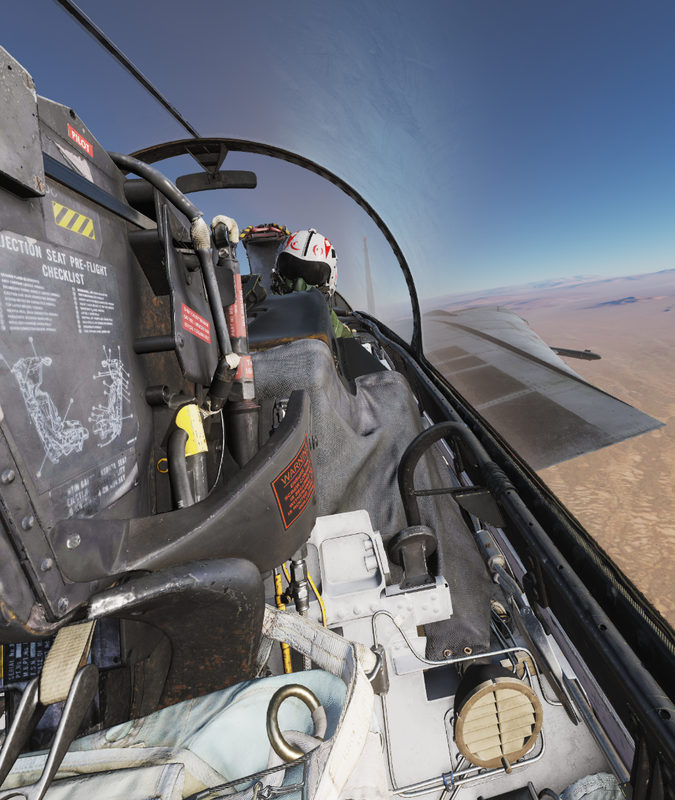 I'd easily say this model is a great learning experience for those of us who always dreamed of and wondered what it was like to fly a real Tomcat. A while back I said I wouldn't buy it for a bit because I was and still am learning to complexities of the Hornet but I am glad I made the jump. She's a challenge and now, I have a LOT more to learn but it's all good! Hey Storm! Very Happy She's meeting your expectations,I feel very Similar. I'm just starting out with the "Instant Action" mission Takeoff at Nellis,On my first "Touch-n-Go Landing" Jester told me my landing brought "A tear to his eye" LOL......Not sure if he was being Sarcastic or not! She's just incredible in VR......Cockpit is best since Mig-21 IMHO. Very Well behaved at slow speeds......She has tons of lift under those massive wings. I am finding her a bit hard to keep trimmed,Very hard to keep perfectly level...Should make A/A Refueling a Real Challenge. Was cool that all my Axis controls were already set to go for my TM Warthog....they say they'll add more Hotas's /Sticks later. Don't know about the rest of you but with this latest update & F14, DCS takes super long to load, I'm talking 15 to 20 min to load before getting to the F14, and when it finally does the hard drive is constantly going, and I get a notification Jester's sound file not found, DCS was butter smooth and quick to load before this update and Tomcat, maybe an update will fix ?. Controls are set by default to give the F-14 a best setup with the Warthog. However, there's a known bug with the openbeta version where the control inputs for some users will not save when using the button press to select the button. The work around is to use the drop down menu to select the button. This might require you to do it twice. Once to figure out what button number/name then close and then reopen to use the drop down. Pretty much my exact experience with DCS. Honestly I dont have the time I used to for super in depth study level aircraft any more. The process of controls assignments is actually not anymore difficult than using P3D. It's just a *different* method, but it's just as easy. 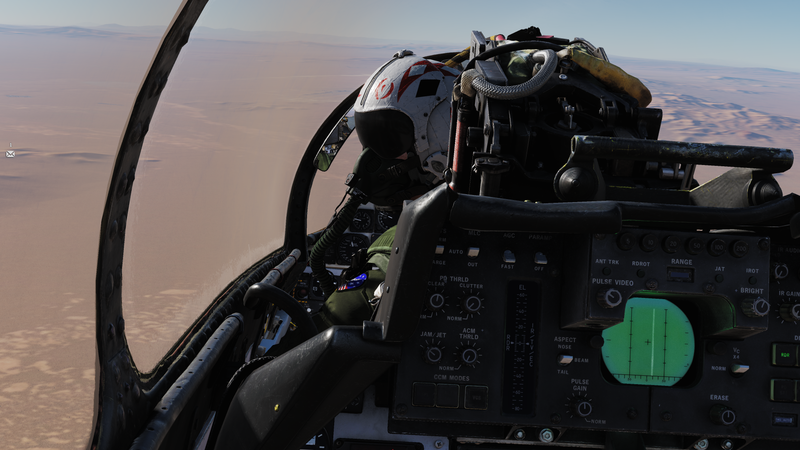 The confusing part may be that DCS offers custom controls for EVERY aircraft independently, instead of a one size fits all global assignment like P3D where you need to change assignments based on your aircraft every time you switch. DCS offers a lot more flexibility that way. Other confusion could be that similar control inputs between different aircraft won't have the same name/description. So it becomes a annoyance that way. Last edited by 000rick000; March 14th, 2019 at 11:05. Yep, once mine finally loads, exact same result. This is the module that makes me get TrackIR. I've been flying it since release and I really can't get enough, Heatblur has set the bar so impossibly high for every other developer. They could have sold the F-14B as it is now and it is a gold star module, add to it the Forrestal, F-14A, and a couple campaigns coming soonish, and its doubtful anything better will ever come along, I'd say. 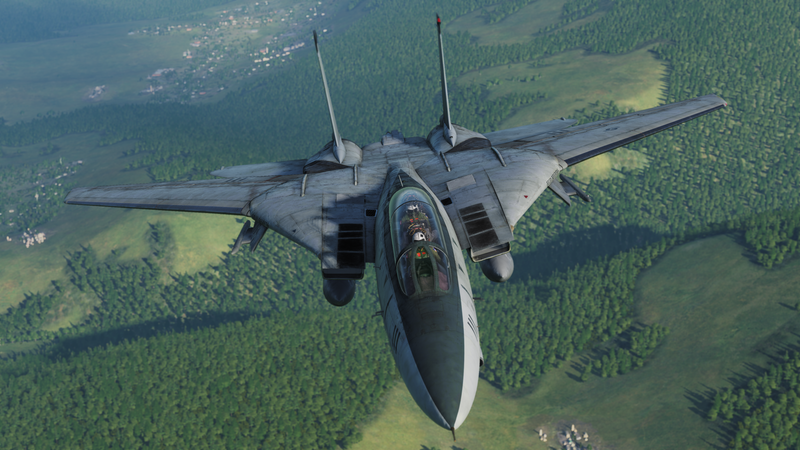 I am so glad I finally convinced myself to pre purchase the F-14, with a week to spare . What an amazing machine! I have always loved the F-14 but to now practically getting the opportunity to fly it I am astounded. I really need to read up on the systems, as the startup was a struggle, although I managed it. The full start procedure is very long. It took ages. Once I had started it up my next step was to go to the carrier takeoff training mission to have some fun. And fun I did have!!! I love this module, and I'm sure I will love it even more once I learn more about it. Don't forget to turn on the Walkman! LSHFT+M to play. LSHFT+N to stop. So much fun. Complete with cassette player startup effects of high to norm rpm playback. Me in the RIO POS with one of our groups members. What's amazing is that you can jump into multi crew ops on the fly during the mission. We were doing formation work and then decided that we wanted to test out SRS comms in multicrew ops. Ridiculous fun! Especially when the RIO plugs the walkman into the ICS! Thanks for that video Ted, it gave me a laugh, once I realised the title was misleading . I discovered something really cool while reading the comments for that video. 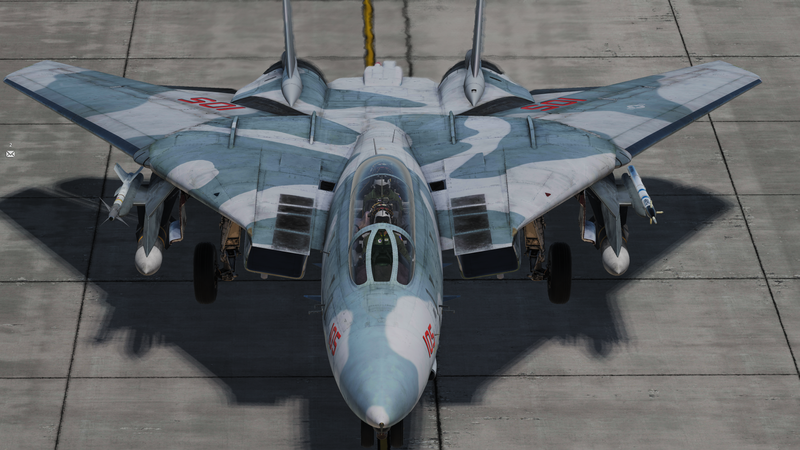 Apparently if you encounter an F-5 with the black paint and star on the tail Jester will call it out as a Mig-28. I need to try this! Same here...What is the fix? Yes, since I installed the Tomcat, DCS is super super slow to load, and stutters terribly, to the point of being unplayable, is there a fix, or update coming ? ?, tried everything but so far nothing helps. Maybe try deleting the shaders?